Wm Hickey, age 30, born in Ireland; portrait painter; $100 personal property. Lucinda J Hickey, age 25, born in Missouri. Allen Hickey, age 1, born in Missouri. Hinchey, Wm J., age 50, born in Ireland; parents born in Ireland; portrait painter. Hinchey, L. J., wife, age 40, born in Missouri; father born in North Carolina; mother born in Missouri; keeping house. Hinchey, Allen, son, age 21, born in Missouri; father born in Ireland; mother born in Missouri; school teacher. Hinchey, Paul P., son, age 18, born in Missouri; father born in Ireland; mother born in Missouri; works on farm. Hinchey, Robert E., son, age 16, born in Missouri; father born in Ireland; mother born in Missouri; works on farm. Hinchey, William W., son, age 14, born in Missouri; father born in Ireland; mother born in Missouri; works on farm. Hinchey, Augustus, son, age 6, born in Missouri; father born in Ireland; mother born in Missouri. Hinchey, Flora B., daughter, age 4, born in Missouri; father born in Ireland; mother born in Missouri. Hinchey, Lucinda, head-of-household, age 64, born Jany 1836 in Missouri; father born in North Carolina; mother born in Missouri; widow; 6 children, 6 living; owned home (mortgaged). Hinchey, Emett, son, age 36, born July 1863 in Missouri; father born in Ireland; mother born in Missouri; single; occupation: photographer. Hinchey, William, son, age 34, born Jany 1866 in Missouri; father born in Ireland; mother born in Missouri; single; occupation: clerk, R.R. office. Hinchey, Gussie, son, age 26, born July 1873 in Missouri; father born in Ireland; mother born in Missouri; single; occupation: photographer. Hinchey, Flora, daughter, age 24, born Aug 1875 in Missouri; father born in Ireland; mother born in Missouri; single; occupation: retoucher, photograph. Johnson, Mary E., servant, age 18, born Oct 1881 in Missouri; parents born in Missouri; single; occupation: servant. Born in Dublin, Ireland, William Hinchey was the second son in a family of eight children. He began painting and drawing as a boy, encouraged by his father, a superintendent of government buildings. By the time he turned twelve, he had earned enough money painting portraits to pay half of his tuition at Trinity College. He later attended Oxford and during the 1840s studied painting in Paris. 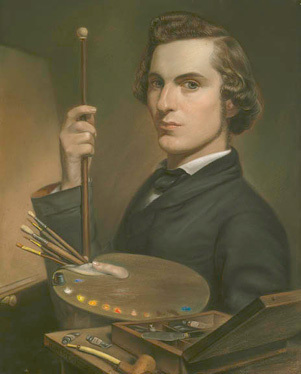 Accompanied by Bishop Lamy, Hinchey came to the United States in 1854 to assist in the restoration of Spanish missions in New Mexico and to paint pictures for new Catholic churches. Prevented by ill health from completing this work, in 1856, he established a studio in St. Louis, where he was befriended by the painters Manuel de Franco and George Caleb Gingham and became a successful portraitist. In 1857 he taught art and French at a girls' school in Arcadia Valley, Missouri, while continuing to maintain his St. Louis studio. In 1862 Hinchey went to Washington, D.C., where he painted portraits of well-known statesmen, among them Ulysses S. Grant. He also recorded Civil War battles and activities in forts and camps in Iron County, Missouri, and in St. Louis, publishing his sketches in Frank Leslie's Illustrated News and Harper's Weekly. Hinchey died in St. Louis after being thrown from a cable car. 1860 census, 10th Ward, St. Louis, Missouri; roll M653-654, page 754, line #35, dwelling #1206, family #1483. 1880 census, District 53, Arcadia, Iron County, Missouri; roll T9-0691, ED 53, page 543D, line #42, dwelling #169, family #174. 1900 census, DeSoto, Valle Township, Jefferson County, Missouri; roll T623-867, ED 62, page 12A, line #34, dwelling #239, family #248. Biography & Genealogy Master Index (BGMI); http://www.ancestry.com.